I am writing this on the hottest recorded day in the UK since 1976. In Kuwait it’s the hottest recorded day anywhere… ever. As brows sweat and roads melt, the temptation to leave the jacket at home and enjoy the cooling effect of motion is overwhelming. But it doesn’t have to be that way; modern motorcycle jacket designs allow a refreshing through-breeze. I once rode my motorcycle around Egypt in July. Even in the sweltering desert temperatures the cleverly designed open-zip ventilation system gave me 3,500 miles of cool and comfortable riding. Let’s take a look at the many options for staying cool and safe. Good solid all rounder at a great price. Well specced CE armour with removable liner for summer comfort. Special Offer – Comes with free pair of Dojo jeans. 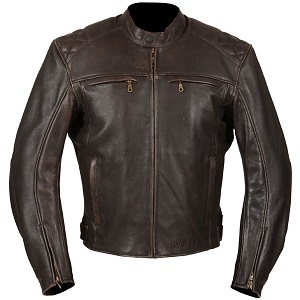 Superb quality leather motorcycle jacket at a reasonable price. This is a well made item that oozes style and class and can be worn on or off the bike. Comes complete with back, shoulder and elbow armour and a removable lining. Leather or textile is the first choice that you will need to make. Modern textiles have advanced a lot in recent years and the truth is there is not much difference between the two in terms of protection. That being said, there are other differences that need to be considered. Often it simply comes down to each riders individual style. We take a look at the pros and cons of each below. Leather is tough and offers great abrasion resistance. Modern leather jackets can incorporate all the key features needed in a summer motorcycle jacket, including ventilation panels, armour and liners. Looks good and feels “right”. Leather is not as water resistant in wet weather. Can be difficult to clean and requires more looking after. Expensive. Leather will nearly always cost more. Textile jackets are generally lighter. Have the advantage of more pockets and mini-storage areas for maps and phones. They are usually more adaptable than leather with greater options for insulation, waterproofed linings and attachable pants. Not as much abrasion protection as leather. Textile jackets can be bulky and will not fit as snugly as leather. 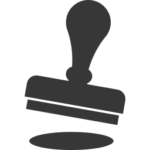 Less durable than leather and will need replacing more often. 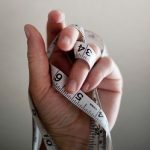 The more expensive and complex the item the greater the need for a good fit. Leather generally offers a tighter fit and is a softer material so will be more comfortable on long journeys. Textile can be more bulky, however it is usually lighter and will offer more ventilation. You should consider linings and your ability to reach and stretch. A jacket that hampers movement is a distraction and a possible safety concern. Consider hot, cold, wet and dry riding conditions and the duration in which you’ll be in them. A quick shower is very different from hours in the driving rain. Will your attire handle the job? Rain resistance is usually achieved with waterproofing lining. Pay special attention to the quality and effectiveness of this lining. Removable insulation lining allows you to ditch a layer of your jacket while remaining safe. Some models may be worn all year round simply by adding or removing these linings to suit the seasonal variances. 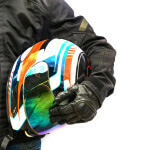 Summer motorcycle jackets come with a range of CE approved protective features such as elbow, shoulder and back armour. The addition of padding in strategic locations further protects the summer rider. For extra reassurance consider the thicker materials offered by leather designs and anti- abrasion jackets featured in our reviews. It’s not always about the impact or the slide. Summer brings out the big flying insects and a well-covered rider avoids the worst of these seasonal pests. 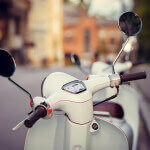 Imagine sitting on your motorcycle riding along in the middle of summer. What might you need and when? Accessing those all-important items at short notice is made easier with a good selection of pockets. Hopefully your riding techniques don’t require the frequent retrieval of your license for inspection by law enforcement officials. More likely you’ll want to pull over, blow your nose, ring your loved ones, spend some cash in a petrol station or stop to take a photograph.Strategically located pockets make those tasks all the more simple and fluid. Other important features are wrist, neck and waist straps. Having wind, rain or insects flying into your clothing at speed is uncomfortable at best and dangerous at worst. Decide whether you wish to attach riding pants or fit a hydration system for in-ride fluid intake. 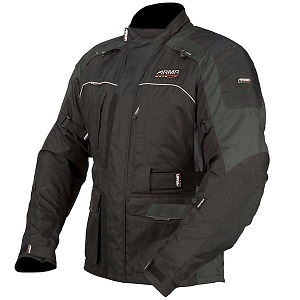 Buy a Moto Kiso and you’ll get a very stylish, practical and well-priced jacket. 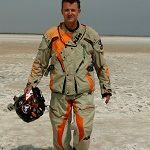 ARMR, a relative newcomer to motorcycle clothing manufacturing, has a great philosophy for its designs: ‘Performance and protection, comfort and fit, quality and durability and style and value’. Their Moto Kiso jacket ticks all these boxes with well-designed features for the heat, the cold, the rain and the unexpected.Multiple waterproof pockets allow you to conveniently access your documents, wallet and mobile phone. 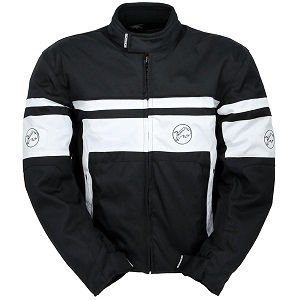 Adjustable fastening straps around the wrists, waist and neck keep the jacket tight when riding in the wind and rain. Will it fit? I should think so; the Moto Kiso jacket comes in eight sizes from small to 5XL. And where better to look for style than the very fashionable Weise Thruxton jacket? You’ll find the protective qualities well hidden in this quality manufactured leather summer riding jacket. Should the heat become too much you can always remove the 100g thermal lining. Following hard on the heels of an adjustable textile jacket, first appearances suggest the Weise Thruxton lacks flexibility. The rigidity of the leather material however is offset by low-profile stretch panels at the shoulders and under the arms. 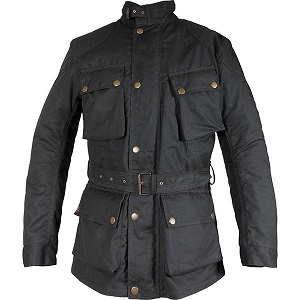 A big plus for this fashionable leather jacket is the generous provision of four external pockets. ‘I say chaps, chocks away.’ This vintage-looking motorcycle jacket is four-seasonal. Some might say that the only thing missing is a Belstaff or Barbour logo but the Richa Bonneville has a style and quality of its own. It’s also very affordable compared it to its legendary look-a-likes. Protection exists in a number of ways not least in the reinforced outer shell. This is constructed of Millerain fabric providing a high-level shield of abrasion resistance. Don’t be fooled! It isn’t the wax coating that keeps the rain off. It helps, and by all means re-wax and treat the outer material as you wish. The lasting waterproofing however comes from the removable membrane inside. Devoid of its many attachments you can wear it like a normal jacket. 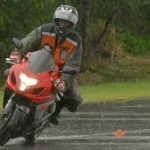 There are a number of sports and activities requiring the practitioner to twist and turn their neck multiple times; few more so than motorcycling with its constant left and right checks. To ease this process and prevent rubbing of the skin Buffalo has incorporated a brushed lining to the collar of their Retro summer jacket. This relatively lightweight-looking jacket has many features such as a waterproof and breathable lining and armour protection at the shoulders and elbows. Its construction is 600 denier polyester. With all that beautiful white material, back and front, it may pick up the dirt a little quicker! At a glance this jacket has a big range of features. Jumping right at you are padded cushions, Velcro fasteners and zips. The GearX Aircon looks more like a racing jacket than a light summer one.It comes with two linings; a removable thermal lining and a fixed waterproof lining. Low price tag equals cheaper production methods. Not much use in heavy rain? A jacket is a very close and personal item completely encasing your upper body. It has many functions including the unintended. On occasions mine has doubled as a safety-deposit box, a kitchen and a small office. I have crammed with hard drives, credit cards, food, passports, smart phones and anything else I wished to protect from water or predators; be they curious animals or thieves. I reached 100,000 KM of tour bike riding this year. My jacket kept me dry, warm, cool, safe, reassured and hopefully… reasonably smart. I’ve had stones and birds bounce off it and various flying insects. Above all it has given great peace of mind. Despite the minor inconvenience of taking it on and off or suffering short term temperature irritations a motorcycle summer jacket is worth every penny you spend on it. Consider it as important as your crash helmet.